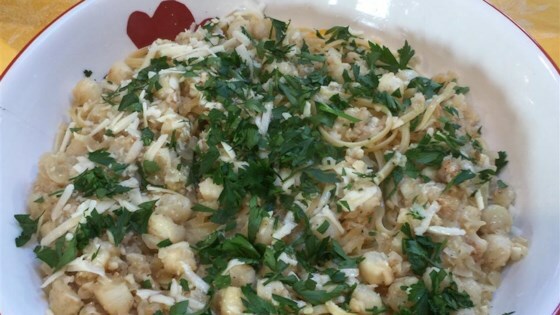 "Scallop Scampi is a healthy and delicious recipe with lots of taste. Serve with crusty bread and a green salad, if desired. If you like a thicker sauce, you can add a teaspoon of corn starch at the end." In a large skillet, melt margarine over medium heat and saute garlic and onion until translucent. Add wine, salt, ground black pepper and 1/4 cup cheese. Add chicken broth and scallops; increase heat and boil rapidly for 7 to 8 minutes. Reduce heat for scallop mixture and add parsley; place sauce on top of linguine. Sprinkle with remaining cheese; serve. Not bad. Need to reduce the wine as well as reduce the chicken stock. Next time I will use seafood stock, it just tasted to "chickeney" to me.